For at least a million years, an asteroid orbiting the “wrong” way around the sun has been playing a cosmic game of chicken with giant Jupiter and with about 6,000 other asteroids sharing the giant planet’s space, says a report published in the latest issue of Nature. The asteroid, nicknamed Bee-Zed, is the only one in this solar system that’s known both to have an opposite, retrograde orbit around the sun while at the same time sharing a planet’s orbital space, says researcher and co-author Paul Wiegert of Western’s Department of Physics and Astronomy. All but 82 of the million or so known asteroids in our solar system travel around the sun in what’s called a prograde motion: that is, counter-clockwise when visualized from above. 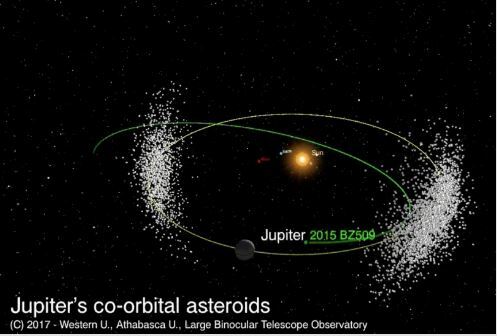 But asteroid 2015 BZ509 (“Bee-Zed” for short) circles clockwise, in a retrograde motion—moving against the flow of all other asteroids in the giant planet’s orbital entourage. Put another way, it’s as if Jupiter is a monster truck on a track circling the sun, and the asteroids in Jupiter’s orbit are sub-compact cars all whizzing along in the same direction. Bee-Zed is the rogue—driving around the track in the wrong direction—steering between the 6,000 other cars and swerving around the monster truck. And it does so every single lap, and has done so for thousands of laps for a million years or more. So how does it avoid colliding with Jupiter? Jupiter’s gravity actually deflects the asteroid’s path at each pass so as to allow both to continue safely on their way, Wiegert says. Little is known about the asteroid, which was discovered in January, 2015. It has a diameter of about three kilometers and it may have originated from the same place as Halley’s comet, which also has a retrograde orbit. The team hasn’t been able to determine yet if Bee-Zed is an icy comet or a rocky asteroid. But their analysis—based on complex calculations and on observations through the Large Binocular Camera on the Large Binocular Telescope in Mt. Graham, Arizona, during a span of 300 days—show Bee-Zed is somehow able to maintain a stable orbit even as an outlier. The calculations conducted by the team show the orbit has been stable for at least a million years and will be stable for at least a million more. Learning more about the asteroid provides another intriguing glimpse into previously unknown and unmapped features of our solar system. “The detective work has just begun,” he said. So is this object maintaining a constant speed in it’s retrograde orbit? Is there a high rotation rate? Is the orbit circular or significantly elongated (i.e. apogee and perigee)? IF the orbit is circular, then it is artificial and is potentially an Easter egg left for us to find as a means of gauging our technological state. Interesting, only discovered in 2015, but it’s been there for a million years? Illogical. It could have been captured into that orbit in 2014, especially if discovered in 2015. But, then all science predates mankind. Quite hard to spot a 3km sized object over 600 million km away from Earth – probably one reason why it didn’t happen before 2015. They’re working on a general theory to explain retrograde co‑orbitals and retrograde orbital resonance. So Jupiter is controlling a body that never comes anywhere near it. 176 million km is greater than the Sun-Earth distance. We may not know exactly how it works, but we know it does work. That’s resonance.